Whether she’s worn her original swimsuit/sash combo or her more recent full body suit, Carol’s consistently been an interstellar badass, but in the character’s upcoming series from writer Kelly Thompson and artist Carmen Carnero, she’s slated to switch up her look once more as she battles her latest foe. Captain Marvel will pick up with Marvel’s greatest Captain being trapped in a localized apocalypse of villain Mahkizmo, the Nuclear Man’s making on New York Island. The circumstances of Carol’s predicament makes it so that she’s unable to call upon most of her fellow heroes for some much-needed assistance. But, ever the problem-solver, Carol soon manages to forge a crack team of Marvel mainstays like Spider-Woman and relative newcomers like Hazmat and Echo to help her save the day. The specific details of Mahkizmo’s plans for the island are unclear, but given his power set and judging from Carnero’s designs for the new team, it’s going to involve some nuclear fallout that leaves things in ruin. 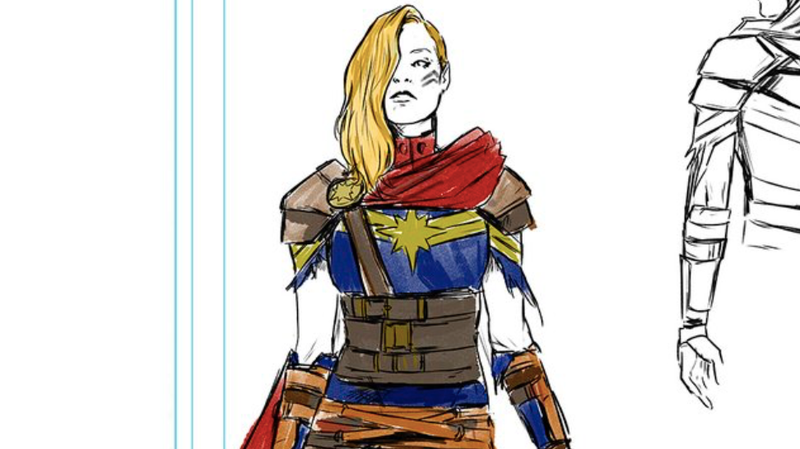 In place of her usual Captain’s uniform, Carol’s new duds are decidedly less Mar-Vell and more Furiosa in design—frayed and torn in some places, but still ultimately functional and reflective of the environment Carol finds herself in. Basically all of Carol’s new girl gang are sporting costumes pulled right out of Fury Road, which makes a certain amount of sense considering that most of their powers involve a degree of being able to tolerate radiation. Echo’s the notable exception, and it’ll be interesting to see how she factors into the team because of her comparatively more street-level fighting abilities when the new Captain Marvel series hits stores on January 2.